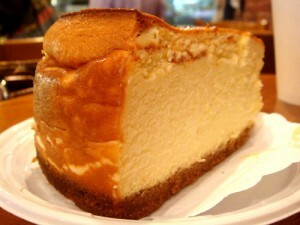 Cheesecake recipe by Sonia Mirza at DesiRecipes.com. MELT BUTTER AND ADD THE CRACKER CRUMBS AND 3TBS SUGAR. PRESS THE ABOVE MIXTURE INTO THE GREASED 9 INCH ROUND PAN(SPRING FORM CAKE PAN). BLEND CREAM CHEESE AND REST OF THE SUGAR UNTIL SOFT. ADD 1 EGG AT A TIME BEATING CONSISTANTLY. ADD LEMON JUICE AND THE HEAVY CREAM, MIX WELL. PUT THE MIXTURE IN THE ROUND PAN, ON THE CRUMB MIXTURE. PUT THE ROUND PAN INTO ANOTHER SQUARE PAN, THE SQUARE PAN SHOULD BE SLIGHTLY LARGER THAN THE ROUND PAN. FILL THE SQUARE PAN W/WATER COVERING THE ROUND PAN HALFWAY ON THE SIDES. PUT IN THE OVEN AND BAKE FOR 45-50 MINUTES OR UNTIL GOLDEN BROWN.